It is with great pleasure that Dubophonic is co-organising alongside Easy Going Productions and Suzie Selecta a unique experience for all the Reggae lovers on the island of Cyprus and establishing an annual event in the heart of summer! 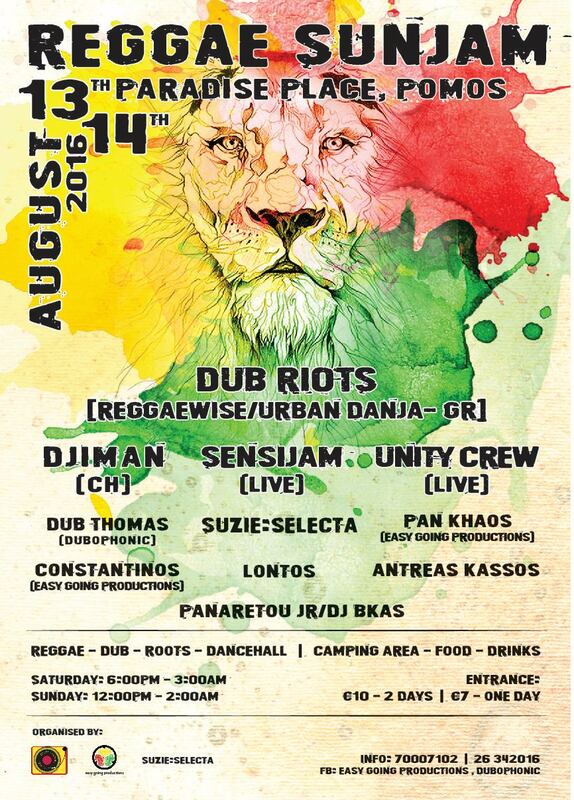 In collaboration with Paradise Place we bring you the first edition of ★ Reggae Sunjam Cyprus ★, a two day festival taking place on the 13th and 14th of August, hosting international artists from our label and a number of local acts and DJs. Reggae, Roots, Dub, and Dancehall will get you dancing through the two days, at one of the most beautiful locations in Cyprus, next to the sea, with the most amazing sunset and nature all around! Free camping place, ital food, drinks and good vibrations. ★ Dub Riots (GR): Dub-Steppa duo formed in 2008 in Athens,Greece, coming to Cyprus ready to smash the dubfloors with their live dub manipulations. ★ Djiman (CH): Singer, dubmaker, dub activist & soundsystem builder, coming from his European tour with Mexican Stepper and with appearances in many countries he meets Dub Thomas in a powerful dub meeting! 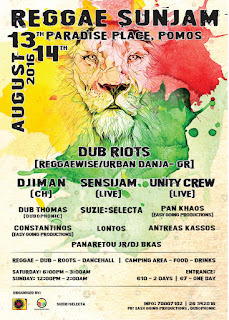 ★ Sensijam (CY): Reggae dub band outta Cyprus formed in 2012 and just returned from their tour in Uk and Holland. Their first single "Uhuru" was mixed at Tuff Gong studios, Jamaica. Big Up brothers! ★ Unity Crew (CY): Live Act outta Cyprus founded in 2015 by djs, singers & players of instruments, unifying the island through the power of Reggae music! Dub Thomas, Med Dred, brother Andreas and sister Christina meed puppa Haji Mike ina unity style!